Given that I ended up rather liking the Madoka anime, I left it quite a while before getting around to watching the movies – and even now have only seen the first one. Rather disappointingly, the first two movies are mere recaps of the series, which I could understand with Evangelion, because after all many years had elapsed since the series and animation standards had risen considerably, so it made sense. Here, though, there was only about a year between the series airing in 2011 and the film coming out in 2012, so it all feels a little redundant to truncate the series for the big screen. Most of it doesn’t even appear to have been re-animated, with the main changes being better backgrounds and a new opening. So in that sense, I’m pleased I left it a couple of years before watching, because I’d forgotten enough of the plot details to enjoy this again without the feeling of rewatching something I’d just seen. 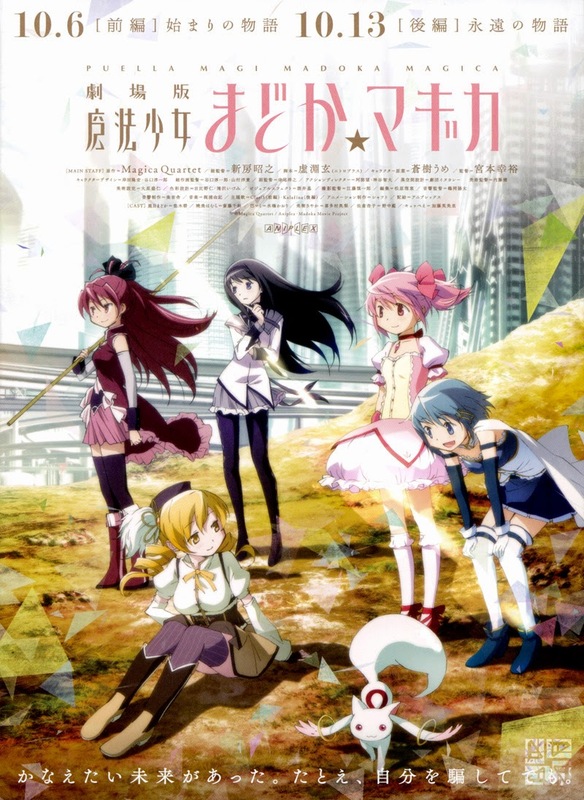 Madoka was a series that I didn’t feel got really good until right at the very end, starting with the tenth episode of the twelve-episode series. Thus a film version covering the first seven or eight episodes didn’t hold that much appeal for me. In fact, I was pleasantly surprised by the flow of this adaptation. It works as a single film, pulling off its typical magical girl setup at just the right pace, Mami losing her head in a stressful situation making for a very good climactic moment in a feature-length film (albeit rather a long one), and then the gradual realisation that Kyubey is not what he seems – or at least, operates with an entirely different moral compass – and the ultimate fate of magical girls works well for a reveal-style ending. But what really makes this work is that it becomes Sayaka’s movie: her centre-stage moments are all there in the series, of course, but because of the way the other characters rise to prominence, she becomes rather peripheral in the overall view of the series. Being the centre of attention here, the film essentially following her story from being introduced to the world of magical girls, grasping somewhat the meaning of it, debating the importance of wishes with Kyouko and becoming ever more powerful and ever more lost until the end of the film, she gets a chance to shine more clearly. I think this works well even if, ultimately, it’s to the expense of Mami, who gets even less of a chance to make an impression as a complete person than in the series, not even getting to talk about her wish. There’s also a strange dynamic in taking a markedly short series and turning it into a film trilogy. It’s rather strange how there’s the same amount of material, yet the impression left is different because the series was shorter than the usual, whereas a film trilogy is longer than usual. It’s odd how less material seems to be longer and given more time to breathe because of this context, but it is palpable how simply being a feature film expands the sense of scope. It turns out that Madoka suited being a film all along! Ultimately, I was on board from the beginning. I love how Madoka subverts the genre, not just by being dark and edgy – that’s no real innovation these days, and I talked about Nanoha a lot in my review of the series – but by subverting it early on and then going on to add in more interesting twists and changes of focus. I’m actually looking forward to seeing the second film, but looking forward the most to seeing what new developments the final, original film will bring. But talking about subversive Magical Girl series that are more sophisticated than they seem at first, go to dark places and would make great movies, how about a Princess Tutu movie version, huh? Now there’s a series that would benefit greatly from reinvention.